Ciccariello-Maher is an associate professor of political science in the Department of Global Studies and Modern Languages. He has held a faculty position at Drexel since 2010 and is currently a visiting researcher at the Instituto de Investigaciones Sociales of the Universidad Nacional Autonoma de Mexico. His tweet was picked up by the blog American Thinker Dec. 25. “The Caucasians among the tender young minds exposed to Professor George Ciccariello-Maher at Drexel University are on notice that their teacher wants them exterminated because of their race,” Thomas Lifson, a blogger at American Thinker, wrote. Conservative news organization Breitbart News also published an article about the tweet Sunday. “Ciccariello-Maher claims to be an ‘expert’ on Venezuela but no where on his Twitter feed is any acknowledgment of the depths of despair that Venezuela has been reduced to as a result of its failed communist leadership,” the article, written by Warner Todd Huston, said in response to another tweet in which Ciccariello-Maher had claimed to be a communist. News outlet LawNewz wrote the article from a different perspective, arguing that the tweet — along with many of Ciccariello-Maher’s other tweets — is satirical and an attempt to anger conservatives. “Finally, Ciccariello-Maher clarified his meaning, implying that he was teasing white supremacists who supposedly worry about a white genocide actually occurring,” the article, written by Ronn Blitzer, read. “Still not everyone has picked up on the gag, which raises the question of whether the controversy spurred by a joke like this is worth it for the limited audience who appreciates it … looking at Ciccariello-Maher’s Twitter page, he’d probably say that’s the whole point,” it continued. Ciccariello-Maher has received a wave of tweets and direct messages in the hours following the tweet. Some are from supportive students, while some are responses from people who were offended by the tweet. Many were threats or too vulgar to be included in this article. Drexel University released a comment related to the incident Sunday. 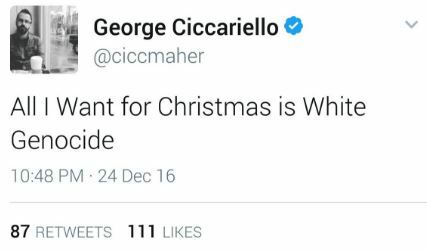 “Drexel became aware today of Associate Professor George Ciccariello-Maher’s inflammatory tweet, which was posted on his personal Twitter account on Dec. 24, 2016. While the University recognizes the right of its faculty to freely express their thoughts and opinions in public debate, Professor Ciccariello-Maher’s comments are utterly reprehensible, deeply disturbing and do not in any way reflect the values of the University,” the statement read. “The University is taking this situation very seriously. We contacted Ciccariello-Maher today to arrange a meeting to discuss this matter in detail,” it continued.